Most children do not have naturally straight teeth, and braces can help to correct crooked teeth and misaligned bites. Unfortunately, many insurance companies do not cover braces, and so many families cannot afford this expensive orthodontic treatment. Consider your options before you rule out the possibility of braces for your children. On average, a full braces treatment costs between $1,800 and $6,500, according to the Cleveland Clinic. Braces treatment can take over a year to complete, and often requires many long appointments. The estimated cost of braces for your child might come as a shock. Before you rule out braces as a luxury treatment, consider the significance of orthodontic treatment. 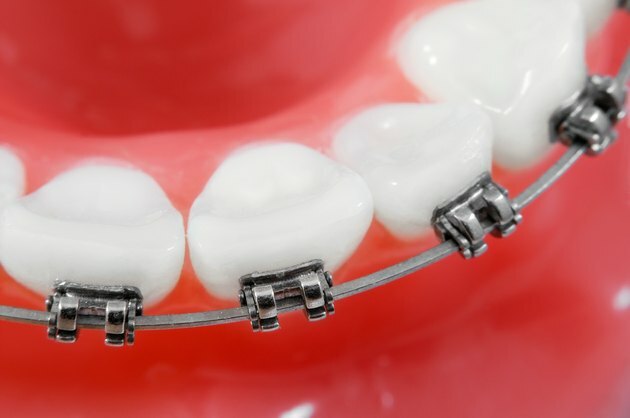 Braces can correct moderately to severely crooked teeth, as well as underbites and overbites. Straight teeth can promote better self-confidence, and they also hold up better in the long term, according to Kids Health. Furthermore, severe overbites or underbites left uncorrected can cause jaw pain. Proper orthodontic treatment can prevent your child from experiencing mouth pain or discomfort in later life. Consult your insurance company to find out whether it will cover braces, and how much help it will provide. If your insurance company cannot help you afford braces, consider waiting until your cash flow situation improves. The structure of treatment and the benefits of braces remain the same for children of any age, so you can afford to wait a few years before beginning your child's orthodontic treatment. If you do not think you will be able to afford braces at all in the near future, consider alternatives. Apply for the Smiles Change Lives program. This program provides reduced-cost braces treatments to children between the ages of 11 and 18 in the United States. Elligible candidates must demonstrate financial need as well as well-cared for teeth that require a single phase orthodontic treatment. The program provides orthodontic treatment for $500 or less to all accepted applicants. Dental schools often offer reduced cost braces treatments in order to train new orthodontists. Consult your dentist for information about nearby dental schools, and then inquire about reduced cost treatment at those schools. Experienced orthodontists supervise all orthodontists-in-training during treatment. Braces treatment might take longer at dental schools, warns Kids Health.